Fǫgr er hlíđin, sva at mér hefir hon aldri jafnfǫgr sýnzk, ..... ok mun ek ríđa aptr ok fara hvergi. So said Gunnar when, about to ride away from his homestead at Hlitharendi after being outlawed. He looks back and decides that he cannot leave the place he loves. By staying he knows he could be killed by his enemies and the decision leads to many more deaths than his. I am led to reflect on this scene from the Njal’s Saga as I re-read some of this great literature in preparation for a visit to Iceland in a few weeks. We hope to see the Northern Lights (hence the apparently senseless visit in the winter rather than the midnight sun period in the summer). 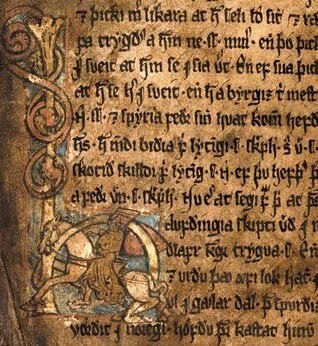 I also hope to get a look at some of the manuscripts of the sagas on display in the museum in Reykjavik. Gunnar’s inability to ride away in spite of realising the fateful consequences of his decision is one of the great statements of attachment to place. In a culture of viking forays to far-flung places he nevertheless feels bonded to his home so intensely that he has no choice but to remain there. In spite of the wise ministrations of Njal, after whom the saga is named, the ensuing blood feud follows tragically in the wake of Gunnar’s decision to stay and Njal himself is burnt to death in his house. In the saga it is a twist of fate that leads Gunnar to stay. He is on his way abroad. His horse stumbles and he falls off and finds himself sitting looking down at his home. In context his decision is seen as heroic rather than sentimental. But for me the scene is as much about attachment as it is about determination. I’ve always felt the pull of the North in spite of the sunshine and food of southern climes. But previous trips to places like Norway have always been in the summer. Winter will be a real challenge to any sentimental attraction, in fact my response might well need to be heroic! Good luck!! I've always wanted to go myself! I hope you both have a wonderful time. It's a place I'd like to go myself.